The CS:GO skin gambling saga continues. After declaring it would start taking action against a list of alleged guilty parties last week, Valve has now cemented its intentions by issuing cease and desist orders to over 20 different gambling sites (including one Dota2 site) for using their Steam accounts for commercial purposes. In turn, this breaches the terms and conditions of the alleged offenders' Steam Subscriber Agreements. 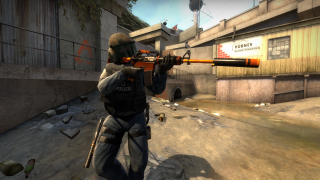 This has been a tricky story to follow, so allow me to recap: although skin gambling in Counter-Strike: Global Offensive has existed for about three years, the topic was thrust into the spotlight just over two weeks ago when it emerged betting site CSGO Lotto was in fact owned by two YouTube personalities who’d previously promoted the site without obviously declaring their involvement. If you’re unfamiliar with how CS:GO betting works, I’d suggest checking out Evan’s detailed overview. As players play the game, they earn cases which, when opened, grants them randomised skins for their weapons. In order to open said cases, you’ll need to cough up actual money, and once acquired you can trade with other players. Ultimately the websites in question allow users to bet their skins against match outcomes, or use them to gamble in a variety of casino-style, browser-based games. “We are aware that you are operating one of the gambling sites listed below. You are using Steam accounts to conduct this business. Your use of Steam is subject to the terms of the Steam Subscriber Agreement ("SSA"). Under the SSA Steam and Steam services are licensed for personal, non-commercial use only. In response, CSGOBig suggests it is only “shutting down temporarily” and that it’ll “definitely be back soon." The wording of Valve’s pretty explicit order, though, might suggest otherwise. We’ve contacted Valve for further comment and will update as and when we hear back.